Hitch up the team and come on up. Yes, those horses are actually wearing snowshoes! Plumas County history is in large part a history of transportation and the amazing feats of derring do that our brilliant and intrepid pioneer ancestors exerted in the winter months to simply get around. 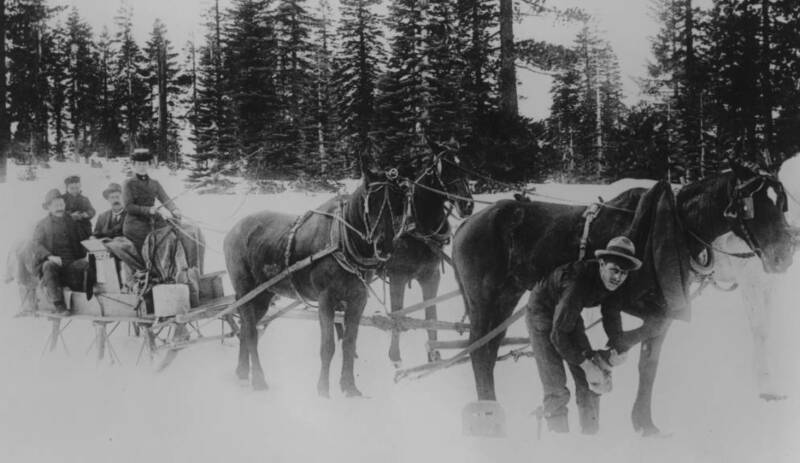 One of those methods which I described in an earlier post was the completely unique transport by longboards, also known as snowshoes, which was introduced by a mail carrier known as Snowshoe Thompson. It didn’t take long for winter residents in Plumas County to see the exhilarating possibilities of competitive downhill racing, and so Longboard racing took off. The following is a detailed account which appeared in The Plumas National and reprinted in The Plumas County Historical Society Publication 3 of the contest of 1871 which took place at the notorious mining camp at Jamison City. 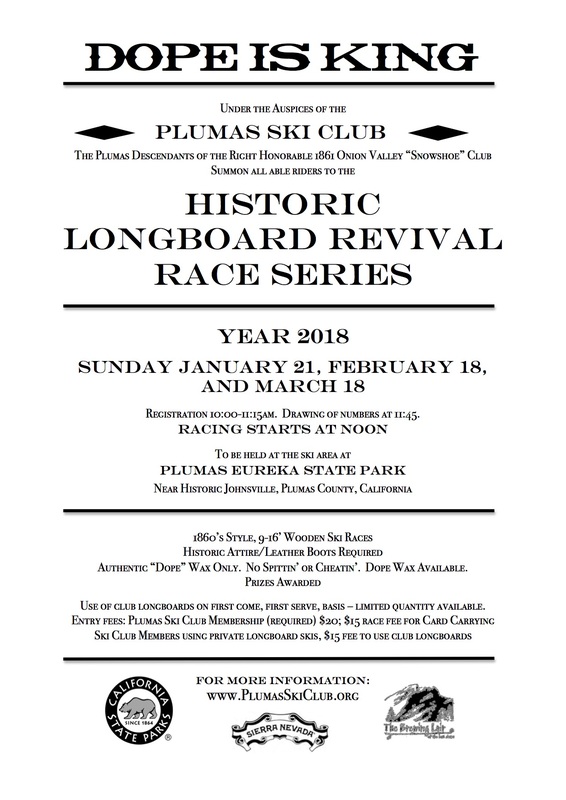 Jamison City was replaced by the more respectable, but no less athletic town of Johnsville, host of our modern day races at the historic Plumas Eureka Ski Bowl. Jamison City had an excitement, and singularly enough for the place, it was unattended with the annual spring fighting, though whiskey flowed in profusion, and almost every person felt its enlivening influence. The event was a snow-shoe race of three miles, for a purse of two hundred dollars, the contestants being four of our citizens, viz: Mr. Chris Kennan, “a wearing of the green,” Mr. Frank Surratt, with scarlet colors, against Mr. Louis Christopher, with crimson and Mr. Chas. Hanson, in blue, the citizens making a purse in addition, of fifty dollars, to be given to the second man in. The day was beautiful. The morning opened with a slight crust upon the snow, but the first beams of the sun dissolved that, and by the time set for starting, eleven o’clock, the snow was soft and wet. The course selected was from a point something of a mile above Eureka Lake, down to and crossing the lake, it being covered many feet deep with snow; thence upon an up rise of about fifty feet in one hundred yards; then by an irregular descent to the top of the band overlooking the town–having a declivity in its whole length of sixteen hundred feet. At the signal all started in fine style, Kennan and Surratt gaining rapidly for about a thousand yards, when Surratt, in passing a tree, broke a shoe and came down, Keenan running upon him and also coming down, with a shoe broken. Hanson added his body to the pyramid, but was soon on his shoes again, while Christopher steered clear, and for a moment had the race all to himself; but Hanson soon came up to him upon a steep pitch, and the two came between the poles, Christopher in ten and a half minutes, and Hanson fifteen seconds later, winning both purses. Experts, who were upon the ground, say that with shoes and snow both in excellent order, the distance could be made in seven minutes. The snow yesterday was too wet for fast time. Keenan and Surratt, although defeated, are not dismayed, and challenge any parties living in the Jamison Mining District to a race over the same course for any sum, from $250 to $500 a side. It was pleasant to see the good feeling prevailing. All parties repaired to the town and had a good time, keeping it up far into the small hours, both parties vying with each other in their convivial efforts, and dispensing hospitality with no niggard hand. The first two races were cancelled this year for lack of snow, so don’t miss this last race. Love the pic! Love the history! Go longboard ski races!! So happy we have snow!